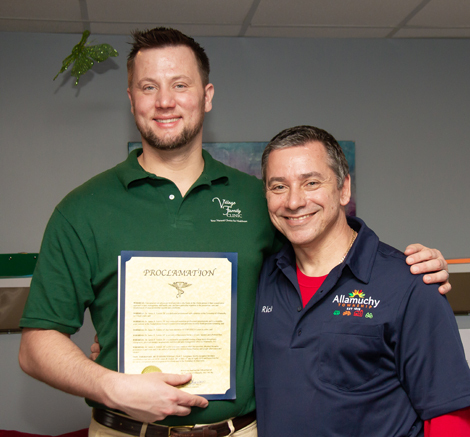 “It’s been an amazing 15 years here in Allamuchy Township and it’s been a pleasure to serve the people of the town and surrounding areas,” proclaimed Dr Fedich. The practice began with humble beginnings 15 years ago in a small, 700-sq-foot clinic. Over the years, the clinic has grown to over 4000 sq feet and now includes three chiropractors, two physical therapists, an acupuncturist, and a medical doctor. The clinic is able to help many local residents who would otherwise not have access to this state-of-the-art, multi-disciplinary care. “I love doing these things,” added Mayor Lomonaco. “Special Recognition for special people is a complete joy.” To celebrate its 15 years of success, Village Family Clinic held a Patient Appreciation Day and Easter egg hunt. The clinic had many children come for the Easter egg hunt, bouncy castle, and pictures with the Easter Bunny. Additionally, the clinic gave away all its services for the day. No credit cards or insurance were needed! Chiropractic, acupuncture, and physical therapy services were all free. The clinic has a long tradition of giving back. In addition to the open houses where the services are free, Village Family Clinic has a large food drive every year, donating over 80 turkeys to the needy. They also run a large pet food drive, a toy drive during the holidays, and a shoe drive for the homeless. “I am always looking for a way to give back to this great area,” stated Fedich. Village Family Clinic specializes in treating many different conditions such as low back pain, neck pain, headaches, disc problems, stenosis, elbow and shoulder pain, knee pain, and much more. Using state-of-the-art technology, like cold laser, spinal decompression, and their unique team approach, the clinic routinely helps people that other providers are not able assist. To learn more about the clinic, visit http://www.hackettstownfamilyclinic.com, or call 908-813-8200. Hello again from Hackettstown NJ’s Village Family Clinic. It gives us tremendous professional reward when our once pain-stricken patients feel so good that they want to share their treatment success stories as does Carrie D. below. She mentions a number of our services in her video that combined to turn her life around after her long-term suffering from a herniated disk. In a moment, watch the video and hear from Carrie herself. Before that though, here’s some level of detail regarding her treatment services for sciatic pain such that Carrie once suffered. Our team at Village Family Clinic provides sciatica treatment that provides relief from pain in your back, hips, and legs stemming from trauma involving the sciatic nerve. As soon as our chiropractor and sciatica therapist examine your spine and look over your medical history as part of our comprehensive chiropractic treatment, they are going to review all of the various alternatives you have for sciatica treatment. Some treatment plan alternatives include appointments with a physical therapist and spinal decompression. Our patients who experience sciatica treatment in Newark and Allamuchy NJ notice a difference in just after one or two sessions. So enjoy watching Carrie’s pain management success story. We did, and thank you Carrie! When it comes to professional reward, sometimes a smiling face offering select few words says it all. Christine’s came to Village Family Chiropractic Clinic here in Hackettstown with severe pain and seeking pain management via a Hackettstown NJ chiropractic care team. We are so proud to have returned a smile to her face and can’t thank her enough for her continuing faith and trust. After each and every treatment that includes spinal decompression and other proven chiropractic services, Christine gets ever so closer to her goal to be completely pain free. That she’s getting there without the need for painful surgery or for the need of opioid medication is the type of success story that we all celebrate as a staff each and every day. Please know that you DO NOT have to live with pain. Christine will attest to that! Call us. Researchers in Spain and the United States report that “Patients who received physical therapy consisting of manual techniques for carpal tunnel syndrome” achieved results comparable to outcomes for patients who had surgery for this condition. Physical therapy patients saw faster improvements at the one-month mark than did patients treated surgically. For three weeks, the therapy patients received weekly half-hour manual therapy sessions - meaning therapists only used their hands. The therapists focused on the neck and the median nerve. They also applied manual physical therapy to the shoulder, elbow, forearm, wrist and fingers. The Physical Therapist also instructed the patients on how to perform neck-stretching exercises at home. After one month, the therapy group reported greater daily function and greater "pinch strength" between the thumb and forefinger compared to the surgery patients. After three, six and twelve months, however, improvements were similar in both groups. All participants experienced similar reduction in their pain, but the physical therapy group showed faster improvement. 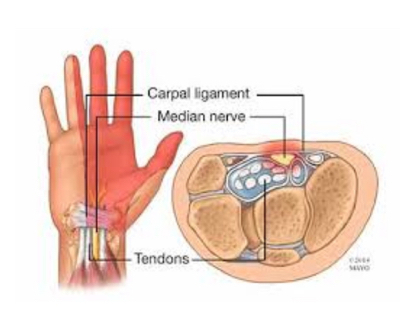 Carpal Tunnel Syndrome, is typically caused by compression of the Median nerve in the palm facing area of the wrist. This can cause symptoms such as numbness and tingling typically of the thumb, index, middle and thumb side of the ring fingers. In more advanced cases of carpal tunnel there can be constant pain, decreased hand strength and loss of sensation in the hand. This overtime can cause a loss of ability to use the hand for work and everyday activities. Include repetitive maneuvers related to work, hobby or home activities. It can also be brought on by pregnancy because of edema, or fluid retention. Other possible causes are underlying inflammatory diseases, degenerative, and rheumatoid arthritis, hypothyroidism, or an underactive thyroid or diabetes. Trauma, such as dislocation or fracture of the wrist or structural problems in the wrist joint, lesions in the wrist, a cyst or tumor in the carpal tunnel. Patient’s subjective history of thumb and finger numbness, tingling, pain and strength loss of the affected hand. Imaging scans: An x-ray can show whether there is a fracture or some other disorder, such as rheumatoid arthritis and an ultrasound scan can check the structure of the median nerve. Studies have found that MRI scans are not useful in diagnosing carpal tunnel syndrome. Study co-author Joshua Cleland, a professor with the physical therapy program at Franklin Pierce University in Rindge, N.H. stated "Manual physical therapy may be just as beneficial in improving function and symptom severity as surgery despite the severity of their condition," he also noted that 38 percent of those in the therapy group had "severe" carpal tunnel syndrome. Cleland went on to state "Surgery is necessary when there is muscle weakness or atrophy from the nerve being compressed at the wrist." However, operations can have complications, said Cleland. He cited a previous research finding that "approximately 25 percent of individuals undergoing surgery for carpal tunnel syndrome experience treatment failure with half of those requiring an additional surgical procedure." So based on the findings of this study if you considering surgery for your “Carpal Tunnel Syndrome” physical therapy can be considered a first line option with just as effective results and less complications. J Orthop Sports Phys Ther. 2017 Mar;47(3):151-161. doi: 10.2519/jospt.2017.7090. Epub 2017 Feb 3.The Effectiveness of Manual Therapy Versus Surgery on Self-reported Function, Cervical Range of Motion, and Pinch Grip Force in Carpal Tunnel Syndrome: A Randomized Clinical Trial. 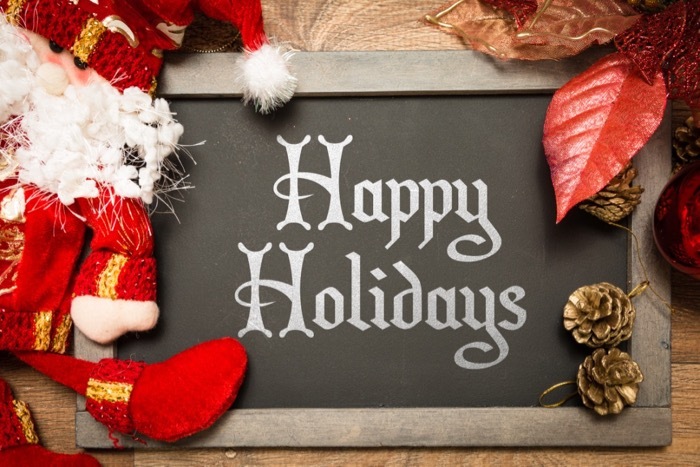 Fernández-de-Las-Peñas C, Cleland J, Palacios-Ceña M, Fuensalida-Novo S, Pareja JA, Alonso-Blanco C.
Our warmest Holiday wishes from the entire team here at Village Family Clinic. Calendar year 2018 was, and continues to be, a truly remarkable year and we take this moment to recognize the joy that each and every one of you has brought to our personal and professional lives. We exist because of your faith and trust in us. 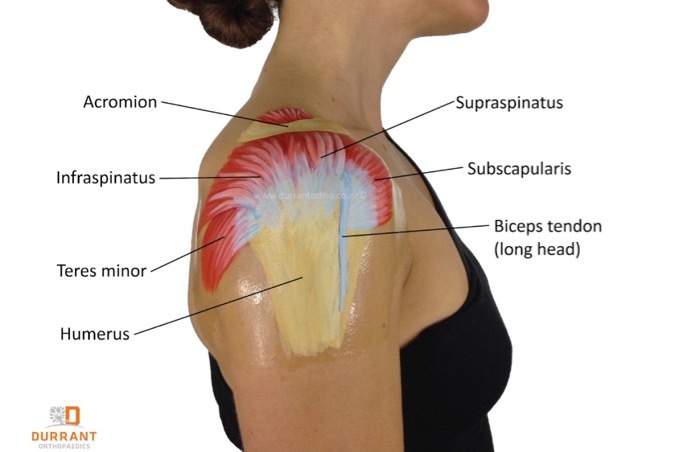 It is the tendinous attachment of 4 muscles that start from the Shoulder blade (Scapula) to attach to the top of the Shoulder (Humeral head). Tendons attach muscle to bone and allow the muscle to move/control the joint. Tendons can sustain tears as a result of trauma (fall, accident etc.) or because of wear and tear (aging, sport or work demands). Pain and stiffness around the top of the shoulder, pain on the outside of the upper arm, pain at night that interferes with your sleep, pain, and difficulty or inability to lift your arm overhead and weakness of the arm. About 35% of partial tears will increase in size over 5 years follow up but most remain less symptomatic then full-thickness tears. Tears that are more anterior and involve tears into the ‘Cable” region are usually more symptomatic and typically require surgical repair vs conservative care. Management of pain/inflammation via Cortisone Steroid Injection(CSI) tends to be short-term relief of 4-8 weeks but may allow the patient to tolerate other interventions. Significant outcomes can be achieved when programs are prescribed by physical therapists, Patients of varying age, duration of symptoms and severity of pain and disability can achieve significant outcomes, Pain production or pain avoidance during exercise does not appear to matter. Village Family Clinic offers proven conservative care such as Physical Therapy, Chiropractic care, Nutritional counseling, and Acupuncture. If you are having shoulder area pain and problems we offer care to help you get back to the activities and life you want to have!.